After more than two weeks of only crochet, having knitting needles in my hands again feels kind of strange. I was soon back into the rhythm of it though. 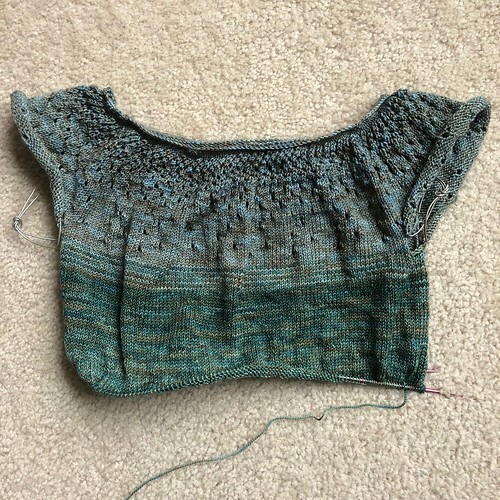 The Raindrops pullover is well into the second color now (Jasper). I'm in the stockinette section of the body and it's just plain, simple knitting. I have to watch my measurements because I'll need to start blending in the third color soon! It feels good to be working on more than one project again now, but I was a good PinkLemon and finished the partial row on the blanket and got all the ends woven in before I switched projects. By the time I went to bed last night, I had completed 27 rows on my blanket, and I was 5/6 of the way across Row 28. When the Olympics started, I only had 18 rows, so I completed almost 10 rows over the last 16 days! This also means that once I finish Row 28, I'll only have two more rows before I can start borders. 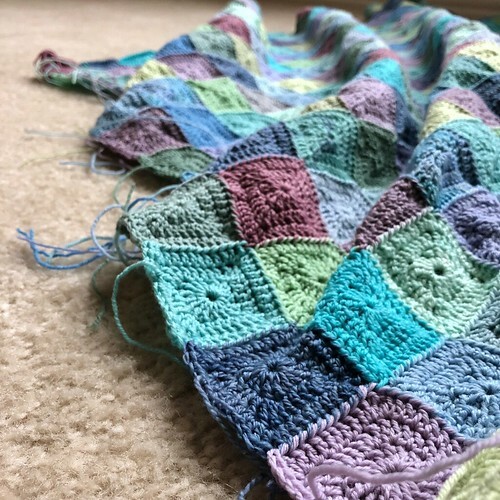 It's now looking possible to finish this blanket this year! Here's a shot of the blanket after the Opening Ceremonies weekend (so I had already added almost two rows). You can really see the difference! 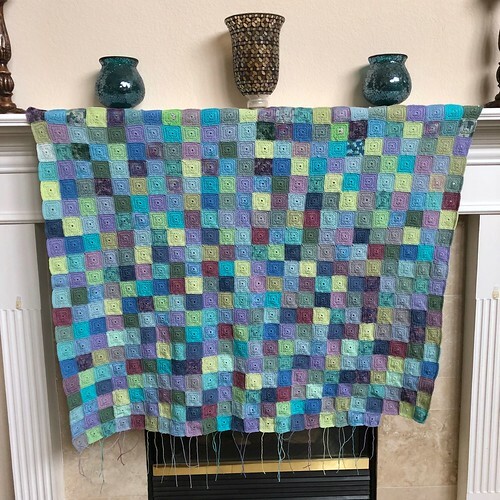 Of course this blanket is all I've worked on over the past 16 days, so once I complete the last four squares of Row 28, I look forward to doing some knitting again! It is now 24 rows by 24 rows. 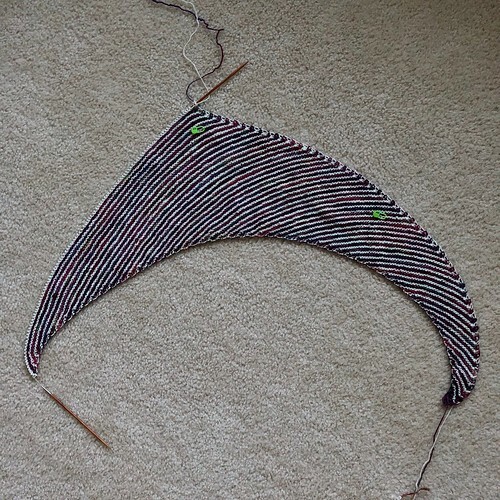 Also, I have officially decided that the final size before borders will be 24 rows by 30 rows. Only six more rows to go! But first, we now return to our regularly scheduled program, Weaving in the Ends. Such amazing feats of geometry seen here today! This sport has come a long way since the Tragic Crochet Incident of 1994 in Lillehammer. Also, keeping crocheted blankets off the bobsled run just makes sense. Now we head back to the Snowboarding events for more knitting! I've started my Olympic (not official) project. I've done the 19th row of my Meditative Blanket, woven in its ends, and I'm three squares short of finishing the 20th row. I'll finish that row and weave in the ends today. Hopefully I can also get started on the next row! Yes, updates on this blanket are what I'll be blogging over the next couple of weeks, but I'm not going to bore you with it every day, just a few times a week, when I actually have something to show. I've started fading into the second color on my Raindrops pullover - Jasper. (Jasper is the name of the second color, I haven't named my pullover Jasper.) I'm also past the patterning in the yoke, have separated the sleeve stitches from the body stitches and can now just knit straight down the body. The Olympics start tonight and while I haven't officially entered any teams for the Ravellenic games, I think I'll play along this time. 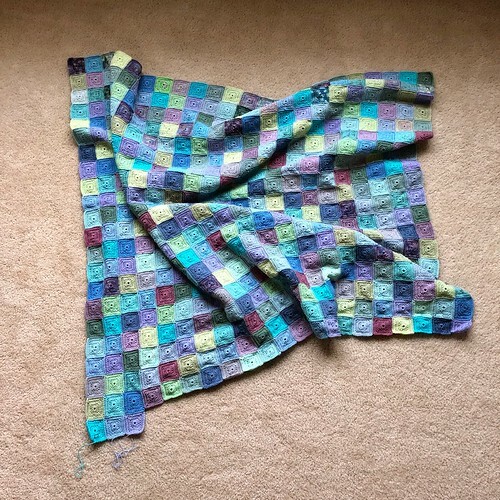 Unless I change my mind between now and tonight, I think I'm going to work on my Meditative Blanket over the Winter Olympics time. Obviously, it's a WIP, not a new project, but I think I could put a pretty big dent in it over the next 16 days. Also, I'm finding it weird to have two crochet blankets in progress right now. So this means that for the next couple of weeks, the only blog updates I'll have will be Meditative Blanket related. There will be lots of little squares! I'm still working on the stripes of my Ramble. As I type this I realize that I didn't prewash the Aniversario (or the Natural, but of the two, if there's trouble, it won't come from the Natural). The odds are that I won't ever have to wash the shawl, but I'm a little skittish around stripes at the moment, as I'm sure you can understand. I've started a new pullover! 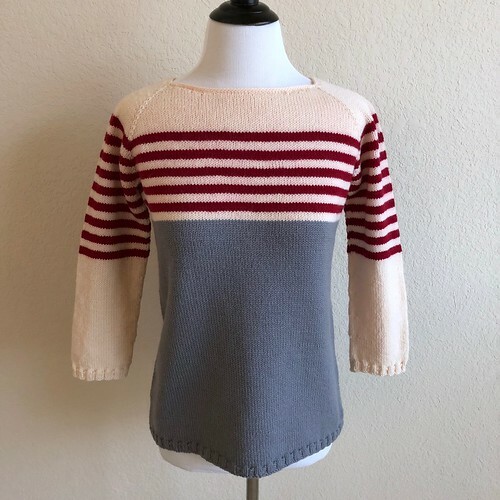 This is the Raindrops pullover and I'm doing it for the Eat.Sleep.Knit first quarter KAL. I wasn't sure if I was going to do this one because Tin Can Knits isn't really my style. Don't get me wrong, they've got some nice designs, but most of them aren't really me. 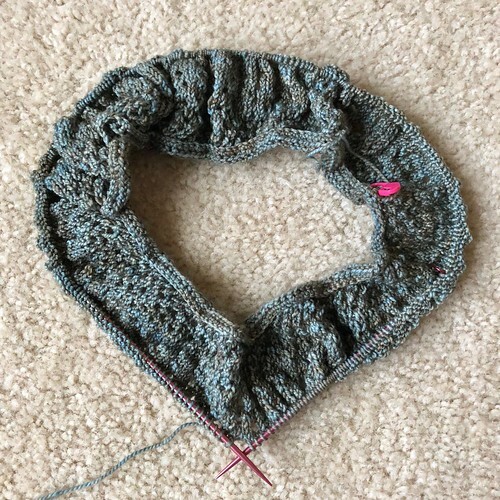 So I've been going back and forth, trying to decide if I was going to do this first KAL, but then I realized that I have four skeins of Madelinetosh Tosh Sock that fade together really well (I was actually thinking of using them for a Find Your Fade) and the Raindrops pullover would work with them. So, here I am, starting to knit. I did prewash all of the yarn just to be safe. Ironically, none of it bled at all when I prewashed it (which probably contributed to my not worrying about the Ravello and just tossing it in the washer). I'm starting with Cove, then I'll fade into Jasper, then Worn Denim, and finally Ink. Except for the Ink, the other three colors are discontinued and that makes me a little sad. 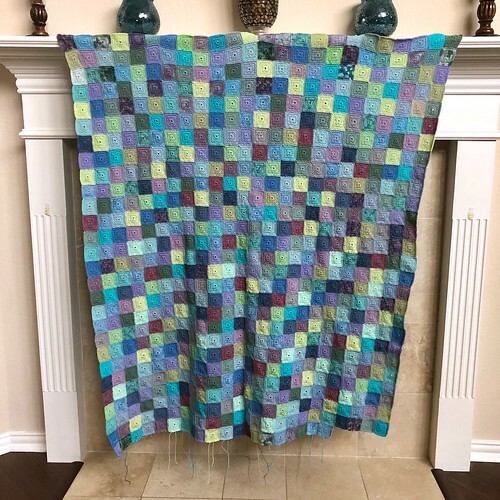 I enjoy the speckles, but Madelinetosh does these subtle variegated colors like no one else, and several of my favorites have been discontinued over the last couple of years. 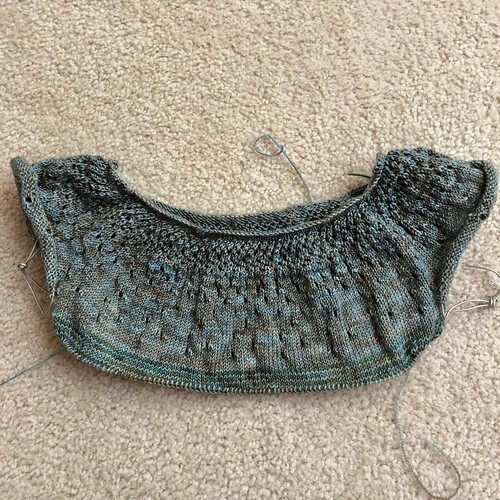 According to the pattern, I should be making the XS or S size, but I don't want a zero or negative ease pullover, so I've decided to knit the M and then I'll block out the raindrop lace section at the yoke. I think this will work. Fingers crossed! My Ravello is completely finished. All the ends are woven in and to block it, I tossed it in the wash. I've used this yarn before (Loopy Ewe Solids Series) and never had any trouble with the colors running, but I've never used red before. It ran. All over the Ivory. This is actually an improvement from what it did look like. I ended up using Synthropol (it binds to free floating dye molocules) to both directly pretreat the red blotches and in the wash along Color Catchers, and that did get rid of the red blotches, but my Ivory is now a strange pink color. I'll probably leave it for a few days/weeks before I make any decisions, but at this point I think my choices are to leave it and toss it on over my PJ's in the morning, or I could try to overdye it (I'm thinking a pale blue which would make the red/pink areas more purple and should still work with the gray, but I'm open to suggestions on this). If I try the overdying and it works, I could have a wearable sweater. If it doesn't work, I've still got something to toss over my PJ's in the morning. While I'm obviously not thrilled about what happened, I'm not heartbroken either. I've learned a new lesson: Never trust any yarn not to run and always prewash! I've got yarn for two more Ravello's upstairs and both will be prewashed to eliminate any extra dye!